The ride list used to be just that — a list of rides. That seemed a little boring, so now there is a summary of each month’s riding interspersed amongst the rides. There is quite a lot in this summary, and most of it is based on power data. Take a look at this in practice on my profile. The bit on the left is fairly self explanatory, with the number of rides, the distance travelled, and the elevation climbed. You don’t need a power meter to get this, and this is all you’ll see if you don’t have one. The middle part is focused on the best power outputs produced in the month. 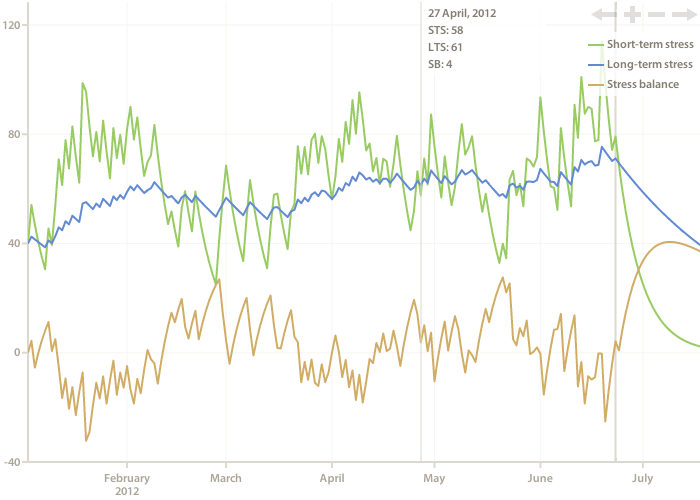 There is a little power curve showing the best power for the month (in orange) and year (yellow). Purple highlights indicate that the best power for this month for this part of the power curve are also the best for the year. Next to that are the best average powers produced in the month for a few select time periods (which happen to roughly correspond with important physiological concepts like neuromuscular power (five seconds), anaerobic capacity (one minute), VO2 max (five minutes) and lactate threshold (twenty minutes)). 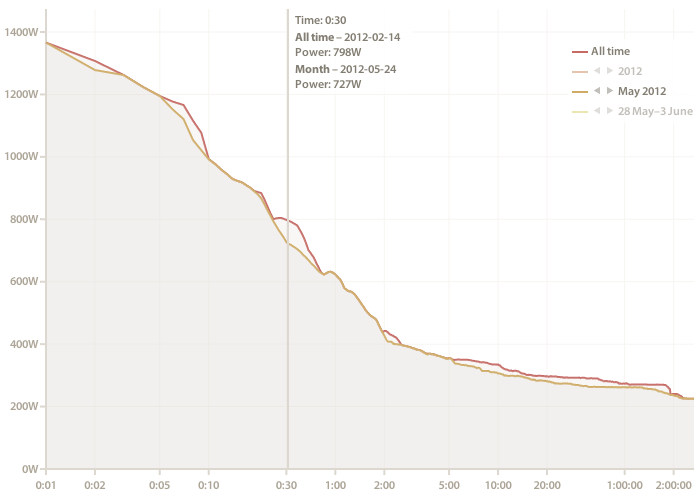 Training load (TL) — a measure of the overall effort of a particular ride. Individual rides aren’t presently shown on this chart. Having a correctly set FTP is very important for this chart to be meaningful. Long-term stress (LTS) — the long term average training load. This is what the body is used to doing. Higher values typically correlate with higher potential performance. Short-term stress (STS) — the short term average training load. This is what the body is currently doing. Stress balance (SB) — the difference between LTS and STS (before the ride). This indicates freshness (for positive values) or fatigue (for negative values). Therefore, in preparation for an important race, it is ideal to have a high LTS (after lots of training in the previous months), but a low STS (after tapering) and consequently, a positive SB. 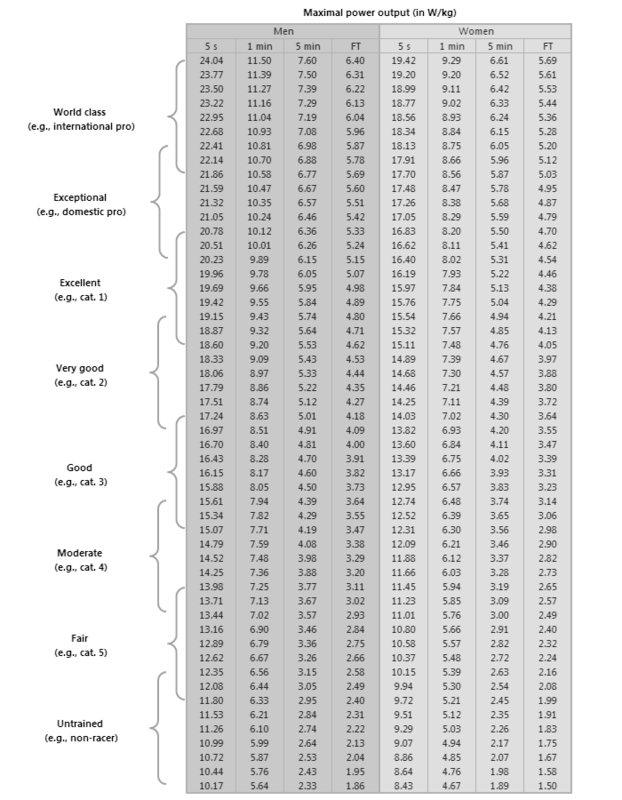 The exact numbers that work best in practice varies from athlete to athlete, so experimentation is required, but this chart makes it possible to quantify them. To get this you just need to connect your Facebook account to your Cycling Analytics account. Go to the Linked accounts page under Account and click Connect in the Facebook box. A Facebook page will then appear asking for your permission for Cycling Analytics to post to your Timeline. Once connected, rides will be automatically posted to Facebook as you upload them. You should also click the button to post to Facebook all your rides that you have already uploaded. This ensures that the historical aggregations that Facebook shows are complete. The box that is shown on your Facebook Timeline is an aggregate (well, two aggregates) of the data you have posted to Facebook for the current time period. It normally shows your last ride and how many kilometers you have ridden this month, although it seems to require multiple rides in the current time period before it shows the last ride. I haven’t quite worked out how Facebook chooses to display what it does. It’s now possible to see your power as watts per a kilogram on the power curve. You’ll first want to add your weight, and then you can click on the W/kg button at the top right of the graph and the values are shown as watts per a kilogram. This doesn’t yet support different weights over time, so old powers won’t be shown accurately if your weight has changed much. For reference, here’s a handy table that Andrew Coggan put together showing what power outputs cyclists tend to be able to produce. You should probably also read Andrew Coggan’s explanation of the table. Note: If you’re looking for a lot more information about what power outputs are typical or what counts as good, check out “How does your cycling power output compare?”. With the recent hacks of LinkedIn, Last.fm and eHarmony that resulted in millions of passwords being stolen, now seems like a good time to say something about password security. I’m going to spend the rest of this blog post saying that passwords stored here are about as secure as they can be. When you log into this website you provide an email address and a password to the server. The server then looks up the user with that email address, and then checks to see if the password is correct. This is where it gets tricky. The simplest way of doing this is by storing the password in the database, which makes checking the password when logging in trivial, except this means that all the passwords are sitting there in the database, and if anybody gets access to the database they can steal everybody’s passwords. Hopefully no unauthorised people get access to the database, but it can happen (just ask LinkedIn). The worst thing about having a password stolen is that people are lazy and reuse the same passwords, so once you have their LinkedIn password, you might also have their Facebook, email and online banking password. Therefore, instead of storing the password itself in the database, the password is normally put through what’s called a cryptographic hash function which takes some input and always produces the same output given the same input, but it’s impossible to look at the output and work out what the input is. It turns a password like “bubbles” into “fe75bd065ff48b91c35fe8ff842f986c”, and that hash is stored in the database. Then, when somebody tries to log in, the password they entered is hashed and the two hashes are compared. If somebody looks at the GPS data from a ride you did, they’ll be able to see exactly where you started and finished, and that will often be where you live. So, in the name of privacy, you can now provide addresses and no GPS points will be shown that are near that address. Users can go to the privacy settings page (it’s one of the pages under Account) and add whatever locations they wish to hide. GPS points are only hidden from other users, so don’t worry if you go to one of your rides and can see points that should be hidden. If you want to make sure it’s working, copy the URL of a ride and go to it after you log out (you can also share rides with others by sharing the URL). One known issue with this is that if you go for a ride entirely in a hidden area (like what you might do on a trainer), the map of the ride will show an area off the coast of Africa (where the latitude and longitude are 0). This will be fixed soon when this learns how to deal with rides on trainers better. 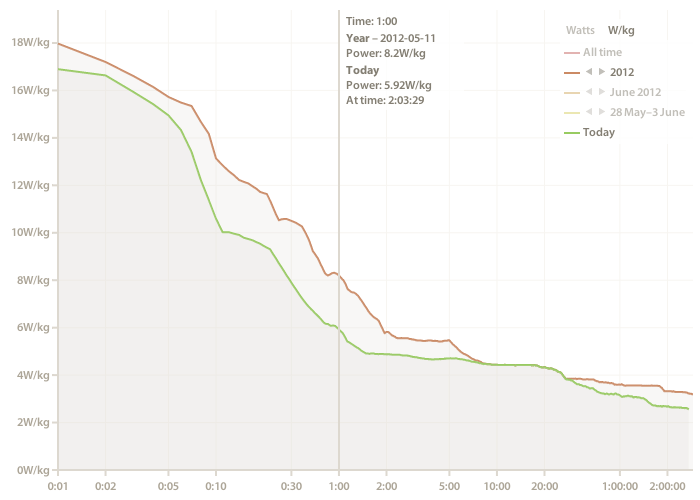 As of today you can see a lot more data on the power curve. Previously it only showed the all-time best powers, but now it can also show the best powers for any year, month or week. If you’re not familiar with this graphic, it shows the highest average power achieved for all time periods. Therefore, it shows the highest average power sustained for five seconds, one minute, five minutes, twenty minutes, one hour and everything in between. It’s useful for seeing what one is capable of doing, and can indicate performance improvements when looked at over time. A good reason for continuing to use a system is because it works very well. A bad reason for continuing to use a system is because you have heaps of data stuck in it with no way to get it out. So, in the interest of openness, and in the general desire to make an exceptionally user friendly product, Cycling Analytics now allows users to download all the ride data that they have uploaded. Users can go to the profile settings page and download a big zip file containing all their rides in the format that they were uploaded in. With the emergence of bike computers that record everything and allow for later analysis, not to mention the rise in popularity of power meters, cyclists have never before had access to so much data. All this data needs to be analysed somehow if it’s going to be of any use. The short story is that I wasn’t completely satisfied with what currently exists, so I made my own. Here it is. 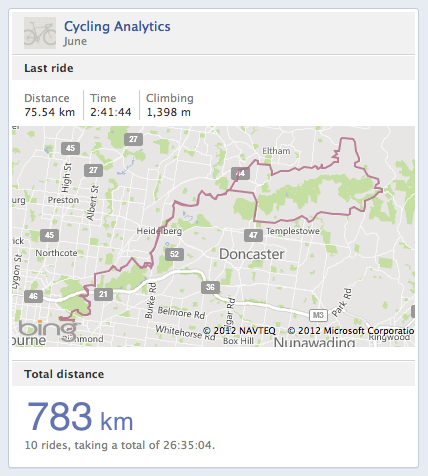 Cycling Analytics is a website where cyclists can upload ride data and analyse it. I could spend a few paragraphs describing the functionality of the website, but it’s easier to just look at it. Here’s a ride I went on recently. From there, you can go to my list of rides, and there’s a few handy analytical tools lying around — a power curve, showing the highest average power sustained for all time lengths, and a training load table, which gives some indication of how much cycling one is currently doing. There’s a few nice things you can’t see without having an account, like the ability to automatically upload rides to Strava when they’re uploaded here. I’ve been using this site for a little while now, and now you can too. For the moment it is free to use, but as of the 22nd of July it will cost $80/year. This site has a particular focus on power data because that data is more insightful than any other. Therefore, having a power meter is highly recommended, but not necessary. This currently only supports FIT files (which Garmin devices create). Support for TCX and SRM files is coming, as well as any other file formats that there is a demand for. You can check to see if your files are compatible with this tool.